It’s time to raise your glass as we toast National Moscato Day! 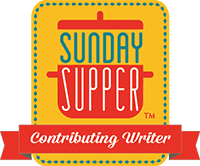 This year, the #SundaySupper crew is teaming up with Gallo Family Vineyards to bring you a fresh and innovative assortment of recipes in celebration. My contribution to the party is this silky mango sorbet, with a surprising twist–it’s made with Moscato wine.